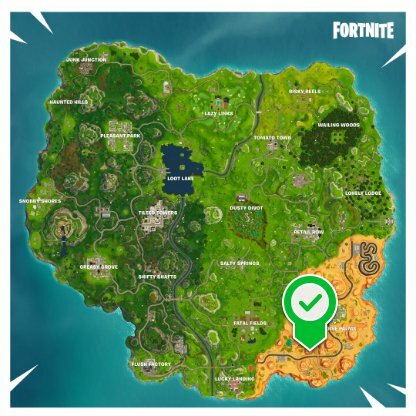 Find the map location of treasure in the "Search Between an Oasis, Rock Archway, and Dinosaurs" to complete the challenge for Fortnite's Season 5 Week 2 Challenges. 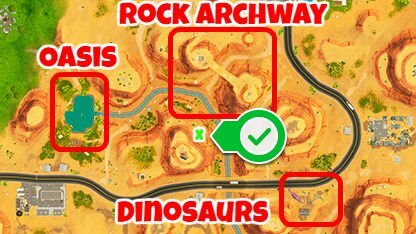 A Battle Star treasure is hidden in the triangle formed by an Oasis, Rock Archway, and Dinosaurs. Find it to gain a 10 Star reward! 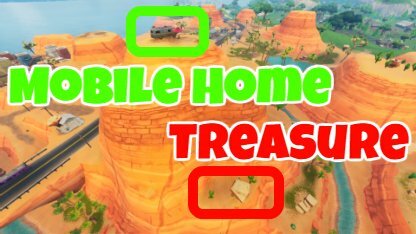 The treasure is located in the new Desert biome introduced in Season 5. Find the treasure within the triangle formed by the Oasis, Rock Archway, and Dinosaurs. If you're dropping directly to the location, you'll know that you're in the right place when you see the mobile home at the top of the mountain.